A team of North Carolina-based researchers helped unearth more clues this summer about the ancient Nabatean city of Petra in Jordan. Parker, a professor of history at NC State, said the team found the pieces while excavating domestic structures in Petra’s North Ridge area during May and June. The statues, which also feature the mythological god Cupid, are largely intact from pedestal to shoulders. 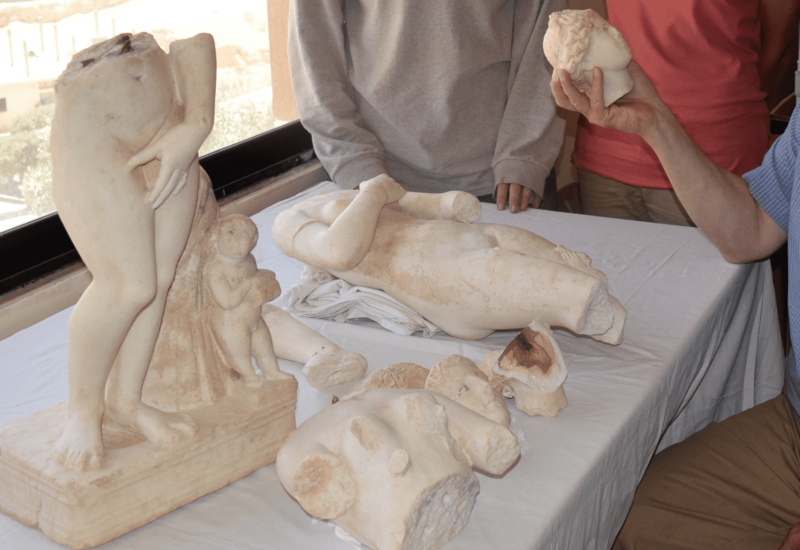 Both statue heads and much of their upper extremities were also recovered at the site and will be restored. This year’s dig marked the third season of the Petra North Ridge Project, an initiative aimed at uncovering clues about the ancient city’s non-elite population. So while the statues are remarkable finds, they’re also somewhat unexpected. The team was digging what they thought was an ordinary home this summer when they came across something much more. The house was more like an urban villa, Parker said, equipped with its own sophisticated bath house. The team found the fragmented statues next to the home’s staircase. “Even though they weren’t exactly what we were looking for, these finds still tell us a lot about the population,” Parker said. The dig team, which Parker co-directs with bioarchaeologist Megan Perry, professor of anthropology at ECU, found a wealth of other artifacts that shed more light on Nabatean daily life. Digging one other domestic structure and three rock-cut shaft tombs, the researchers discovered installations for cooking and storage, occupational remains such as pottery and animal bones, an iron sword, ceramic oil lamps and human bones intermixed with personal adornments and jewelry. “The human remains and mortuary artifacts from Petra provide perspectives not only on Nabataean concepts of death, but also their biological histories while alive,” Perry said.